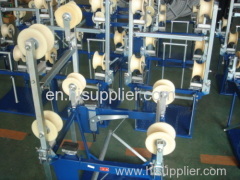 transmission line stringing tools are used for transmission line stringing operation. We designed and manufactured sets of tools include come along clamps, stringing blocks, hoists, swivel joints, fixed joints, running boards, compressors, joint protectors, socket pulling grips, aerial space carts etc. Transmission line stringing tools are widely used in overhead transmission line stringing and tension opeation. Group of transmission line stringing tools has been presented above, want more	transmission line stringing tools and stringing tools, Please Contact Us.